Emile-Antoine Bourdelle (1861-1929) is part of what I call the royal sculptor family. A pupil of Auguste Rodin, he later passed on his knowledge to Alberto Giacometti. It doesn't get much better. Some of the first words that come to mind when you see his work is imposing & romantic, and very eclectic. Although he mostly worked in bronze & marble, you can also find sculptures in clay, plaster, polychrome material & even paintings, sketches & pastels. There's an obvious inspiration coming from ancient Greek & medieval sculptures and maybe I shouldn't say this, but several of his sculptures actually reminded me of the human/Na'vi hybrids who appear in James Cameron's movie Avatar. I'm very tempted to say that Mr Cameron must have been inspired by Bourdelle' work. There's a lot to be said about this artist (most of it unrelated to American blockbusters) as he was very prolific, but as this isn't Wikipedia, I'll just tell you about the museum. This little gem should definitely be on the top of your must-see places in Paris. I still can't believe it's taken me so long to go there as it's one of the most beautiful museums I've had the chance to visit. Located in a little street in the 15th arrondissement near Montparnasse right in the middle of a big architectural confusion of modern & old buildings, the museum is home to the sculptor's original studios & apartment to which a modern extension was added in 1992. And let's not forget the garden of sculptures & the beautiful backyards. There are so many gems I can't even decide which part is my favourite. Maybe it's the sculpture studio that seems to have remained in its original state & allows you to step back in time where you can almost feel the presence of Bourdelle. Maybe it's the beautiful Great hall that will surely take your breath away with its grandeur - or at least make you feel very small. Or maybe it's the backyard, also called the inner garden, a little quiet haven in the shade of the trees where you can admire the sculptures. You probably have go there to see & decide for yourself. Free access to the permanent collections. Opening hours: Tuesday to Sunday 10am-6pm. If there was ever a true hidden gem in Paris, this is it. There's a chance I'll be saying that a lot. Each time I come accross one of Paris' many hidden passages, villas or alleys, I'm overwhelmed by a feeling of disvovery that won't even die once I get home, google it and see how many people it has enchanted already. It's still a discovery to me and an undisturbed moment with Paris. Even though it's so close to bustling Bastille, it seems completely tucked away, like a rural village in the heart of the city. It's quiet, leafy, paved with cobblestones and incredibly charming, as if time just decided to stop 100 years ago. It's named after the man who once owned it and I wish I could tell you more about what seems to be abandoned furniture workshops at the end of the passage, but I haven't been able to find any information about them. But maybe it's just as well to let it keep its mystery. There is one shop left though, a very cute little toy shop that I urge you to visit. Yes, every now & then, there will be some cooking going on and this is where I feel particularly brilliant having named this guide unpretentious. This isn't French cooking in the sense where you'll need a large countryside kitchen or even unreasonable ingredients that must be bought fresh at the local market. But simple doesn't mean it can't be good. Actually, these are my main criteria for cooking: simple, quick & good. You'll also find out very soon that most recipes include something sweet. Somehow, baking is the cooking process that puts me in the best mood, but I do actually eat salty every once in a while. I know I promised some of you that the pistachio chocolate escargots recipe would be my very first food post, but it's been delayed a bit as the pistachio spread still isn't completely the way I want it, but it will be here very soon. This is my favourite cookies recipe. Over the years it's changed quite a lot and it seems to me that I am not far from reaching perfection as to how to get them tasty, chewy & ready-to-go in no time. The last point is very important. If, like me, you find there are never enough chocolate chunks in the cookies you buy, you’ll love this recipe. To tell you the truth, I always double the portions (who doesn’t like happy hour?) or they’re gone too soon. You might be more reasonable than me, so here’s the original recipe. - 75 g hazelnuts cut into halves. Cream butter and sugar. Combine in the brown sugar and the egg. Mix flour, vanilla sugar, yeast & salt in another bowl and sift it into the first mixture. Add chocolate and hazelnuts. Form the cookies with the help of two teaspoons and place them on ungreased baking paper. Flatten them a bit by pressing before cooking them for about 7 minutes depending on your oven. You should take them out when they’re just setting. If you want them a bit harder and less chewy, leave them for about 10 minutes till they look golden round the edges (like the upper picture to the right). I could tell you about how that they store well, but they’ll likely be eaten before. Feel free to replace the dark chocolate with milk or white chocolate if you prefer or even add them all for a triple chocolate cookie. The same goes for the hazelnuts that can easily be replaced by macadamia nuts, pecans or walnuts. We even tried it once with mini Daim bars with conclusive results. If you're following me on Instagram, you knew this one was coming. I've been smitten with this place ever since I visited it a few weeks ago. It's the perfect getaway when winter won't quite leave yet and you're longing for warmth and anything green. Add some beautiful architecture and a touch of exoticism and you're starting to see my point. And I'll admit it, if like me you have a passion for palm trees and this particular Parisian turquoise, you might go a little overboard. Called "Jardin des Serres d'Auteuil", this botanical garden is located on the edge of the 16th arrondissement in Bois de Boulogne, one of the largest parks of Paris. That was a lot of Frenglish. If you're still with me, I'd like to add that even though the site was already a botanical garden under Louis XV, it wasn't until 1895 that these beautiful greenhouses ("serres") were built. They were designed by the famous French architect Jean-Camille Formige who's also behind the park you can find in front of the Basilica Sacre-Coeur. And I can't thank him enough for choosing this stunning colour. Take a stroll in the park. It has lovely gardens of different inspirations; English, Japanese & Mediterranean and you will find plenty of rare trees and remarkable plants, but as you've probably guessed by now, the greenhouses were the ones who stole my heart. I can't list it all here so if you don't want to miss a thing, take a guided tour*. My botanical knowledge is very limited (I usually send pictures to my mother and ask her "what's the name of this tree or flower?") but I did recognise Japanese carps swimming in the ponds (yes, I know they're not trees), an aviary with exotic birds, countless beautiful palm trees, a Katsura - also called caramel tree in French because of the lovely smell it releases in the fall- & a ginkgo Biloba, one of the longest living tree species on earth. Okay, so maybe I didn't exactly recognise these, but I'm good a reading the signs. You'll find magnolias, orchids and much, much more. Some people believe that plants enjoy the sound of music & grow better if you're singing to them. I'm tempted to believe this after stepping into one of the greenhouses with no one else inside and all of a sudden hearing "start spreading the news..." coming out an old radio set (if you're born in the 90's or after, please google this). And so there might also have been a bit of dancing to Frank Sinatra in an empty greenhouse surrounded by ferns & cactus. Free entrance. Open to the public all year, 7 days a week, 9am-4.45pm. The garden closes later depending on the season. This museum might have been the very reason that led me to start a blog. I was so charmed with the place and the whole story behind it that I felt compelled to share more than a few pictures on Instagram. You know that feeling? When you come across a beautiful place that not many people seem to know about and you want the whole world to know. Rest assured, I’m not imagining the whole world will in fact read this post, but sharing it with however few feels good. Beautiful, even on a grey winter day, I promised myself that I will return when spring fully arrives and everything in the lovely garden will be in bloom. It might sound like when you’re buying that shirt because the colour will look good on you once you get a tan, but trust me; Musée de Montmartre looks good any day. It's located in Montmartre’s oldest house, formerly known as the Bel Air House and built in the 17th century, on the top of Butte Montmartre right next to the last vineyards. It hosts a little unique collection on the history of Montmartre and is surrounded by the Renoir gardens. The whole setting is so idyllic; it will make you remember how this place was once a village. The most memorable part of my visit to the museum was entering the studio of Suzanne Valadron. This painter, whom I hadn’t heard of before, has an incredible story. She was born in 1865 and grew up in poverty with her mother who was a laundress (father unknown). She began to work at the age of 11 and at 15 she became a circus acrobat, but had to end that career after a serious fall from a trapeze. This is when she started modelling for artists such as Renoir & Toulouse-Lautrec. (You can recognize her on several of their paintings.) While modelling, she taught herself how to paint and later became the first woman to enter the prestigious Société Nationale des Beaux-Arts. At the age of 18, she gave birth to an illegitimate son, Maurice Utrillo, who would also become a painter. She married a banker and led a very “bourgeois” life for several years, but at the age of 44 she started an affair with one of her son’s 23 year-old friend, the painter André Utter. They were married for 20 years. She and Degas were close friends and Picasso attended her funeral in 1938 after she died of a stroke. Her most known works are female nudes and you can find some of them at the Metropolitan Museum of Art in New York and at Centre Pompidou here in Paris. And most of all, you can visit her studio and private apartment here at Musée de Montmartre. When I went to there, I was lucky to see the wonderful studio of this highly unconventional & rebellious lady without anyone else in the room. This sweet museum guard told me to have a seat on the divan and stay for as long as I wished, and so I did. 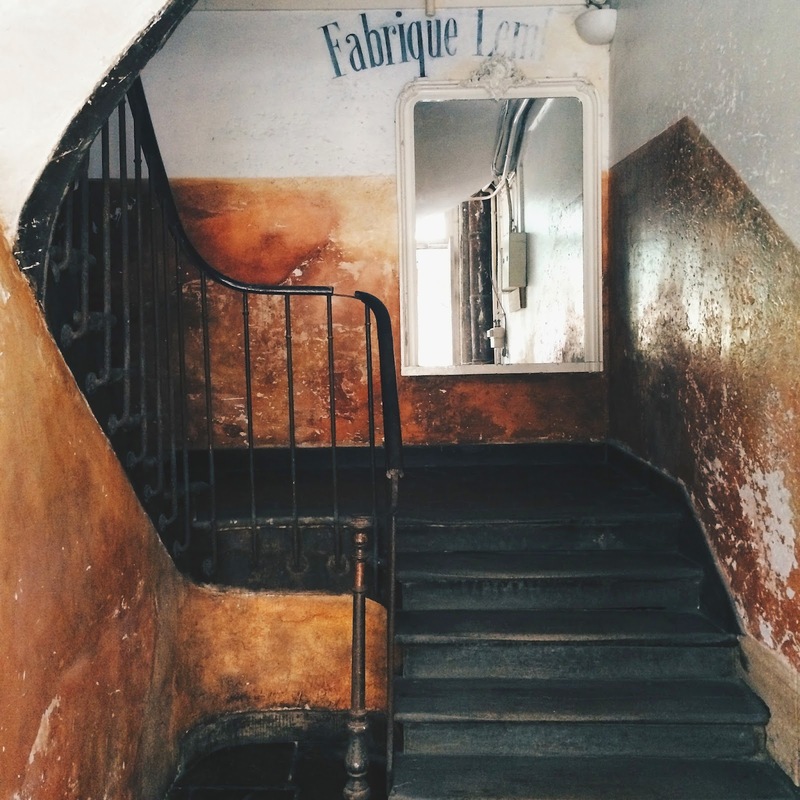 It almost felt like traveling back in time and what more could you really ask of a museum than setting you back in the time and into the spirit of their very collection on Montmartre’s history? Once I got home, I was so inspired by Suzanne Valadron’s work & life that I started reading more about her son, who lived with her in the Bel Air House for several years. Self-destructive and alcoholic at an early age it seems that painting was what saved Maurice Utrillo, even though he spent many years in different asylums throughout his life (I might have a slight obsession with tormented & rebellious artists). Many of his paintings are set in the streets of Montmartre and he was a recognized painter who was awarded the Légion d’honneur. So next time you’re in Paris and/or when you have a few hours to spend, please go and have a look at this little gem. It’s Montmartre, history, architecture, vineyards in the heart of Paris and a lovely garden, what more could you reasonably ask for? But if you must ask, yes they also serve coffee in their little Café Renoir. This very first blog post is not off to the best start as I’ve just been standing with the hair dryer into my keyboard for half an hour to get the last tea drops out. It’s a good thing I don’t believe in signs. While I do imagine this blog will be about Paris, this first post is mostly about blogging. I said it on my Instagram account and I’m repeating it here: the world probably needs one more blogger as bad as I need another hole in my head. But still, I can’t help myself, because while there are countless blogs about Paris, there are very few where I recognize the city I know, the one that’s not about fashion week, trendy coffee places and macaroons from Ladurée. Not that I mind these things - it's difficult to have hostile feelings towards macaroons - but it seems there’s so much more to Paris: hidden courtyards & alleys, forgotten museums, beautiful doors & facades, old villages, secret gardens, small shops, local life & simply people - and an endless amount of stories to be told about each place. I named this blog TheUnpretentiousGuideToParis as a gentle reminder to myself to keep it simple & because not all Parisians are arrogant & pretentious even though the myth is popular & widespread. Okay, so maybe some are... I could have called it the simple guide, but I didn't think that made me sound to my advantage. I also thought about the honest guide, but that somehow sounded pretentious. There will be sunsets too, the Eiffel Tower will appear & I might even throw in a couple of macaroons now & then, because this is also Paris & often too photogenic to resist. All you need to know about me is that I'm not a real Parisian. I'm originally from Denmark, but I've lived here for more than 15 years. My husband is French & my children were born here, making it so much more compelling to make fun of Parisians. There's no way I'm giving you my age. I hope you'll enjoy this blog. Please don't hesitate to leave comments/questions/anything. I sincerely hope I'll be able to master the whole technical aspect of this thing. I have a renewed admiration for bloggers in general, anyone who can talk the url-language and create cute share buttons has my utmost respect. If it wasn't for the ever patient Laura who has helped me through the process, my blog would still look very, very weird. Her beautiful blog has been such an inspiration - www.dearlaura.co - H U G E thank you Laura and thank you for letting me pay you in pastry.